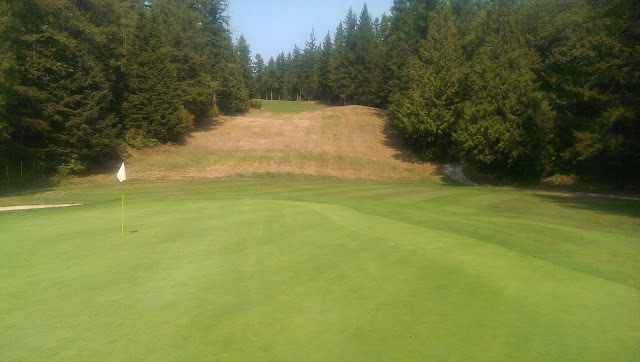 This last winter I used the Sunshine Coast Regional District's (SCRD) Online Property Information System (OPIS) to calculate the areas of the greens, tees, fairways and other features of our golf course. I highly recommend you checking out their site http://www.scrd.ca/imf/imf.jsp?site=OPIS as it has a wealth of information on it and is totally free to use. Although this tool is extremely accurate all of the following numbers are accurate approximations. As we are in Canada these numbers are in meters and hectares. If you are old fashioned and use the ridiculous imperial system then you deserve to do the conversions yourself. Look at all those trees to the right of hole 5 at the bottom of the picture! The total area of our golf course property is 42.56 Ha, 12 of which are developed golf course area and 30 of which are undeveloped natural areas. This means that about 71% of our golf course is natural areas or as I like to call it, "the deep rough." Of the developed portion of the club, 3200m2 is greens, 2650m2 is tees, 39743m2 is fairways and 73767m2 is rough. So roughly 2.5% of the developed area is greens, 2.2% is tees, 33% is fairways and 61% is rough. I took these numbers a bit further to see how much area we physically had to cut per week. We cut greens 7 times, tees 3 times, fairways 3 times, and rough 2 times per week. The total area of grass that we cut a week is about 29.76Ha. If we cut a strip 2 m wide it would stretch 150km! If you add up the man-hours per week you get 160 so that's about 1,875m2 of grass cut per hour per employee or for you imperial chumps about a half acre per hour. There has always been talk about adding another 9 holes to the course but the question of where would it go always comes up. Less that 1/3 of our property is developed leaving over 30 Ha for future holes. Each existing hole averages about 1.3 Ha in size so there is enough land on our current property for another 23 holes!! Of course this doesn't work as length and width need to be considered as well as a large portion of our property is wetland. A few years ago we were trimming back some alders on the right side of hole 5 and I remember some members being quite upset telling us that these trees didn't belong to us! They seemed to think that the elk fence was the property line. The elk fence was put where it was as this was the most economical thing to do. It would have cost a great deal more to cut a swath through the forest and wetlands that border our property boundaries. As you can see from the above picture, there is probably room for 3 additional holes to the right of hole 5! Of course this would probably never happen, but if it did, I think that it could be done on the existing property no problem!